Take a favorite crystal along! Here is a grand fancy hand beaded Illuminator bookmark we've hand made for you, which also is an accurate pendulum. 11 1/2" of French plaid wired ribbon will not mar your books. 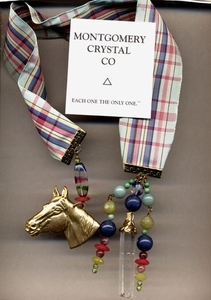 Large 14k goldplated horse charm connects with fuschia horn, tricolor glass, and peridot beads. 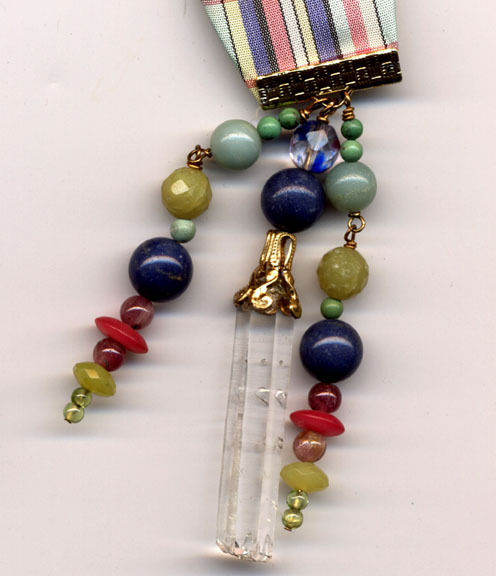 A 3" tassel at the top connects a most unusual bulb-end multi-terminated rock crystal, dumortierite, amazonite, Chinese turquoise, pink tourmaline, facetted chartreuse jade, peridot, and additional tricolor glass beads. Might be the best inspiration to crack a book - or to encourage someone else to!